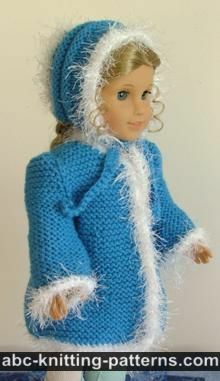 This outfit (see hat pattern here) was loosely inspired by traditional Scandinavian styles. Long-sleeved, long-skirted dresses were traditionally popular. Often, they are decorated along the bottom of the skirt with embroidery and lace patterns. 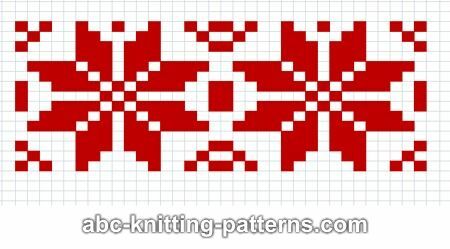 I chose to use Nordic / Fair Isle colorwork instead. 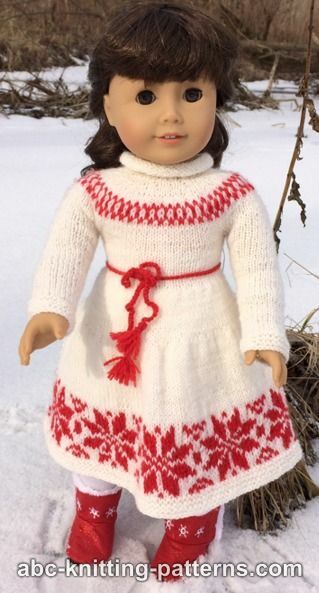 Not quite as traditional for the dresses, but it does come from Scandinavia and is a much better fit for a knitting pattern! 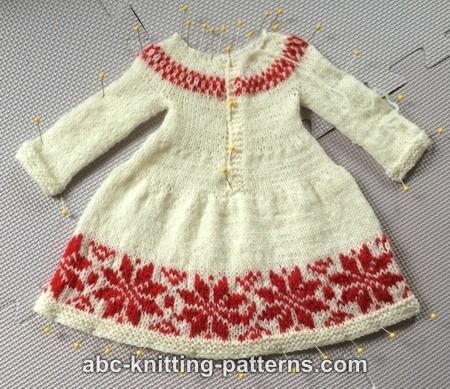 I repeated the same motif for the hat, and worked a narrow band of Nordic-style colorwork around the yoke of the dress to offset the skirt. Add a vest to complete the style! 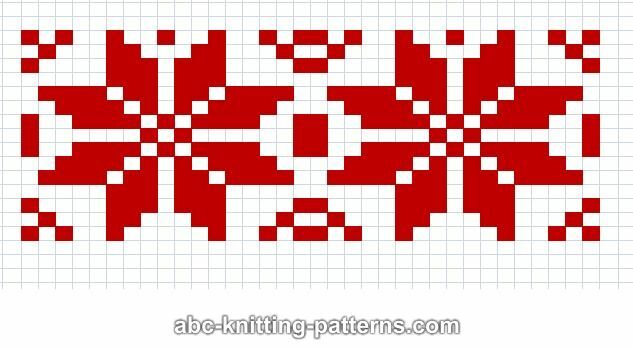 If you are experienced with Nordic-style colorwork, you can substitute any 17-st colorwork pattern for the one that I used. 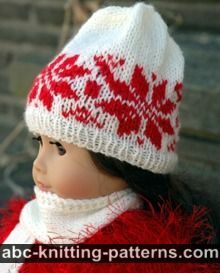 The selvedge/edge stitches are worked as follows: knit the first st and purl the last st.
Color patterns are worked by schemes. Dress is worked top down in one piece with round yoke, first back and forward, with button band on the back, then in the round. The button band is worked on 3 stitches in garter stitch. 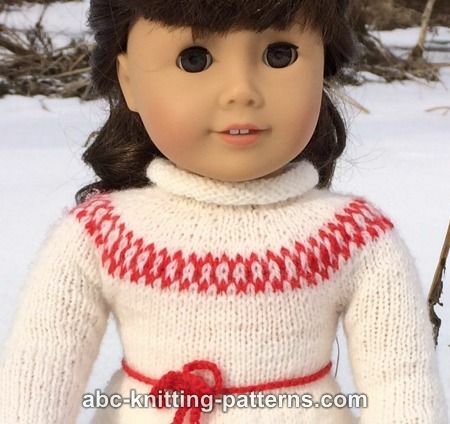 The sleeves are worked in the round on dpn. 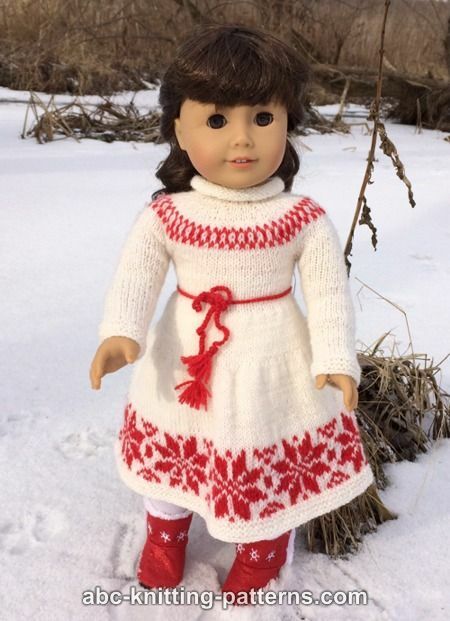 With main color cast on 52 sts: 1 edge st, 3 button band (always knit), 44 yoke (knit in the RS rows and purl in the WS rows), 3 button band (always knit), 1 edge (purl). Row 1 (RS): knit all sts till the last one, p1. Row 2 (WS): k4, p44, k3, p1. Row 4 (WS): k4, p 66, k3, p1. Row 5 (RS): knit all sts till the last one, p1. Row 6 (WS): repeat row 4. 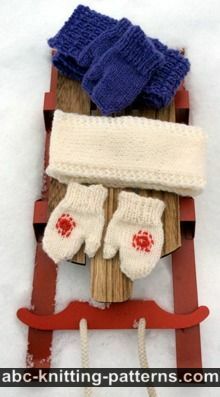 Rows 13-18: work in main color as established: RS rows knit till the last st, p1, WS rows: k4, purl till the last 4, k3, p1. 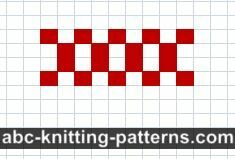 Row 21 (RS): knit 70, p1. Repeat rows 20-21 five more times. Row 32 (WS): like row 20. Row 34 (WS): k4, purl till last 4 sts, k3, p1. Row 35 (RS): knit till the last st, p1. Repeat rows 34 and 35 five more times. Row 46 (RS): like 34. Round 2: *k2, m1 - rep 49 times = 147 sts. Round 3: knit all sts. Repeat round 3 19 more times. The snowflake pattern is a multiple of 17. The closest multiple of 17 to 147 is 153. So in the next round, you will need to evenly add 6 stitches – work m1 every 24 stitches. Work snowflake pattern according to diagram B. After the pattern, work 4 rounds in garter stitch. Bind off. Cut yarn. Transfer 20 sts from the waste yarn to dpn, pu&k 3 sts over underarm sts. Work in the round on dpn in stockinette for 44 rounds, work 4 more rounds in garter st. Bind off, Cut yarn. Pu&k 52 stitches along the neckline. Work 12 rows in stockinette. Bind off. Cut yarn. With red yarn crochet a chain 16" long. Make 2 small tassels and attach to the ends of the belt. If you do not crochet, knit the belt in garter stitch on 3 stitches. Weave in yarn ends. Block. Sew on snaps on the button band. 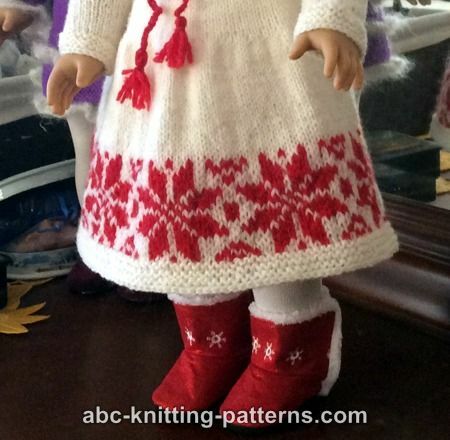 Do these adorable patterns fit other dolls?